Cold Enough and TakeUSBack.com have published! To most people, mice are an annoyance, a creature usually abhorred, if not hated. They are a nuisance to be endured, no matter if your home is the city or the country. Despite all my tales of saving animals, I’m inclined to agree. Yet in several occurrences, I’ve found my reason deserting me. I’ve sometimes let mice trapped in my kitchen cabinets in early fall free, taking them to the far edge of the forest. A mouse dead in a trap is recycled outside with a little solemnity, but no real sadness. It’s just a necessary part of everyday life. Yet when faced with a live mouse, whiskers quivering, eyes wide and fearful, my cold rationale is often overwhelmed by my pity. That is not the only case. While burning up a pile of branches and deadwood this summer, I discovered a nest of baby mice within the pile, their hairless bodies pink, their eyes not yet open. Immediately I set about moving them, even as the fire crackled closer, threatening me along with them. Though several tried to escape, squeaking, I managed to get them all moved out of harm’s way in time. When I returned a few weeks later, the nest I’d moved was intact, the babies gone. That might also be viewed as normal, as death by burning is universally seen as cruel, and those mice were outside. But there was also the instance of The Boat and The Baby Mice. We’d decided to sell an ancient boat stored in a garage. Upon moving it, we’d found evidence of mice: gnawed foam, dropping, and mouse-house litter. Cursing mice in general, we moved the boat a few inches only to have a furry baby mouse stagger over the floor. Two more baby mice were still inside, eyes blinking at us in terror. The baby mouse I’d caught was clearly hungry and lethargic, his tail sunken. Immediately, the consensus was they needed to be fed. A paper plate with Cheerios and other bits of food was quickly placed in the boat’s bottom, with the errant baby. Within moments, one baby was feasting; another grabbing treats to carrying further inside the boat. A decision was made not to move the boat until the following week. When we returned, the food was all gone, and so were the mice, never to be seen again. Other actions of mine, besides the one above, are probably viewed as strange. Perhaps my mind is unsound, my saving of some creatures illogical. Still, no act of clemency I’ve ever committed ever brought me regret, only serenity. The Whole Story + NOR Summer hunt is on! I'm not sure how to put into words the suffering I went through to get Promise Me published. I'm not talking about the editing or crafting of the book cover. Melange made all that easy. Here is the whole story, not the bits and pieces from interviews. My mom had a drug interaction with some medication she was taking in August 2007. Instead of taking her off it, her doctor of the time instead misdiagnosed her with cancer, and told her she had a year to live, at most. She called me at the fabric store on my cell in tears. It dawned on me on my way home from visiting with her that afternoon that I’d always been telling her I was going to write a book, but I never had gotten past a few paragraphs. I was busy with other things and never took the time to write, other than to craft a page-long nature related story for a friend’s magazine now and then. Now I was out of time, and didn’t know if I even would have the time to finish a novel length work before she was gone. I came home that night and started on Promise Me. She of course hated the first few chapters I did, and I madly rewrote them a few times, trying to make them more exciting, so she would get wrapped up in the story and not think about what was happening to her. It was a way to escape for both of us, because none of the doctors understood what was happening for more than a month, and they had to do a ton of tests on her before they understood it was drug interaction. When I got to the end, she wanted to know what happened next, so I kept writing. By the time she was well again five months later, I’d finished Promise Me, and three sequels. Because they were all finished and she loved them, maybe I should try submitting them. I’d won awards in school for writing, and published short animal rescue stories for years in a friend’s nature magazines, but never went further. I was sure if I just submitted to a few agents, I'd get accepted, and would be able to get the book published. The next year, 2008, was a torture session of rejections, made all the worse by the repeated nibbles of interested agents that never went beyond the manuscript. 2009 was more of the same, when I began to try publishers as well. Near Christmas, 2009, my white German Shepherd, Legolas, died. I had already lost my black German Shepherd, Strider, in 2008. Working on my Promise Me novels was painful by that time, not only for the rejections I'd suffered, but also because these books contained both dogs alive and well. And then, like an answered prayer, I got the good news that I was accepted into the Wolf-Pirate Project workshop on the strength of Promise Me's premise. Over the next six months, I worked with my mentor, Eve Mattel, and reworked every single sentence of the work. She took the first part, tore it to pieces, then took out 15K. I rewrote massive portions, some over and over, and a whole new ending. This consumed all my free time, just as writing sequels to Promise Me had to that point. Better yet, Eve's mentoring helped form my new work, Lash. By the fall, I was ready to submit again. once more came the almost contract, the almost agent. I even hired a submission agency to help rework my query letters that January 2011(I was on version 9 by that point). But by Spring 2011, I decided I'd had enough. I was not going to query any more agents or publishers. I was giving up, and going back to enjoy writing. But before I did, I wrote down some nightmares, and sent them in as short stories, for a lark. They got published, to my sheer joy. Then the submission agency told me to take a piece of one of my books and make it into a short story, to get a publisher interested. I thought that was a waste of time, but decided to do it before quitting. Surrender To Me was born in June 2011. Melange, the second company I offered it to, signed it. And now, a year later, all this suffering I went through has been worth it, as I hold my print copy of Promise Me in my hands. If you have a dream, don't give up on it! Lash got the Eight-pointed Star award! A huge thank you to Tony-Paul, who reviewed Lash and awarded him a special ranking because he felt the book deserved more than 4 stars! Fun + Driven = Beautiful! 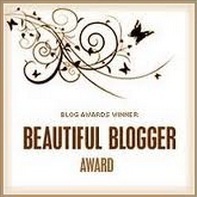 I don't really think of myself as a Blogger, but anytime someone wants to call me beautiful, I'm all ears. 1) I like to swear. A lot. But I try to always be polite in decent company. 3) I put an air conditioner in every year, vow to not wait until a day that is 80 deg. to put it in, and yet always manage to end up sweating and cursing, like today. 4) I worked up the courage to begin tweeting today! Bear with me, as I'm still not sure I know what I'm doing. 5) I love writing. I'm glad that I found it again after so many years and I'm very grateful to my dear husband Eric, for supporting me in my writing endeavors. 7) I'm thinking about cutting my hair in the fall. My husband is against it. I'm debating having a poll to decide, or some kind of contest. Any comments? 8) Yes, I know there were supposed to be 7 facts, but I'm on a roll. I figured out how to post the HTML for the award above myself, through trial and error with the Goodreads instruction. Maybe I'll learn HTML eventually! 9) Promise Me, the first book in my romance series, has been moved up to release in late May. I can't wait! Lash is free for Kindle download again today! Here is the Blurb: Scarred from a childhood spent in perpetual indigence after being forced from their home in the Everglades, weresnake Trystan Valeras and his family make their way to the Case Hotel. When his wealthy gangster father arrives the summer he turns sixteen, Trystan’s dream of a better life, along with the lovely aristocrat Mara, is suddenly within his grasp. Instead of paradise, a series of devastating events unfold, leading Trystan to become the instrument of his dying father’s revenge. His violent reprisal instigates a backlash of murder and death, forcing Trystan to flee with the remains of his family to the sultry city of New Orleans where he sells himself into the service of the Vampire Lord Abraham. Becoming the assassin Lash to hide his identity, Trystan finds a measure of peace, even as his skill with killing heightens, bringing to him not only new allies, but also new adversaries. Lash is FREE right now at Amazon! Say Goodbye is up at Unwritten! Here is just a taste! Glancing up into the rearview mirror, my eyes widened in horror at the sight of Brandon’s bag peeking out from behind a trashcan. I threw open my car door, scrambled out, and ran for the bag. Ripping down the zipper revealed not just the clothes I packed so lovingly, but also my cell phone I’d loaned Brandon. I’d put the bag in Kirk’s SUV myself. Someone had taken it out, deliberately. Kirk’s black Forrester had left a good ten minutes ago. I darted for my car, already dialing 911. Deadline is May 14th, 2012. See above page for all rules! Eating is more than just a way to gain sustenance for my family; it is a path to enjoyment. No wonder than that the meal never tastes as good when the cutlery used does not include the right spoon. I'm not talking about the level of mishap such as the use of a serving spoon in place of a table spoon. But like most everything we own, my cutlery was passed down from other relatives or bought piecemeal, leading to a mishmash of different designs and sizes in the silverware drawer. There are the spiral handled utensils I bought, the flat square-ended ones I grew up with, and the curved with a spiral pattern ones my husband brought with him when he moved in. Then, there are a few--three in all---perfect spoons that don't belong to any of these sets. They are from my grandmother's house, and sized smaller, as they are old; close almost to a child-sized spoon. But they are just right for me. Woe be to the husband who tries to include any of the other kinds of spoons while setting the table! Reminder that the NOR Spring Web Hunt is still on! Get those entries in!